Dr. Ullas G Kalappura is an avid photographer and a travel enthusiast. His areas of interest include nature, travel, landscape, wildlife and macro photography. In 2012, he won the State level photography competition held by the Kerala State Biodiversity Board. He was one among the eight photographers from Kerala who got shortlisted for the final round of the National level photography competition held by Tamron-‘Tamron Challenge 2013’. His photo was among the top ten photos of All India photography competition ‘Photography 5000’ held by whatsurskill.com in 2016. He was awarded the ‘Photomuse Luster Award’ by Photomuse, the museum of photography in 2016. He also secured third prize in the Monsoon photography contest conducted by District Tourism Promotion Council, ldukki in 2016. His photo got into the final rounds of the prestigious Sanctuary Asia Wildlife Photographer of the year awards 2016. 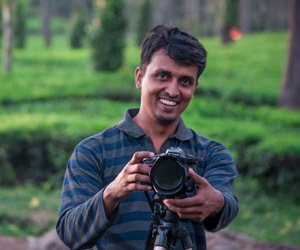 He secured third place in the wildlife photography competition held by Kerala Forests and Wildlife Department in 2017.Apart from photography, he is also a researcher by education. He has several international publications to his credit, and is also a Doctorate holder from Cochin University. Learn all about digital photography and studio lighting….! Shoot school helped me learn all about digital photography and studio lighting. trying given me handle my clients and my work more comfortable.Thanks a lot to all faculties Style, Joseph and Abdul Noushad sir. One of the best Faculties in the market, with more than adequate facilities and infrastructure. They are very helpful and easily accessible for our queries. I certainly can say with confidence that, anyone who is willing to accomplish their dream in photography then this is the place you have to walk in. This is one of the Best place to learn Photography. Gives Professional training in Photography and Post processing.. Expert coaching given by the faculties who are well known photographers.. Best place to learn the art if u are really onto it. A Perfect Intro to the world of Photography…!